Kinect Sports establishes a high bar for the 360 motion controlled games. Although limb tracking best fits the exuberance of Football, Running and Boxing, Kinect's unexpected detection of bodily location and orientation means that it also offers enough control fidelity for games like Table Tennis. There's something about video table tennis that captures my imagination - a combination of accuracy, touch and power that stretches both me and the technology to breaking point. And with the recent move towards motion controlled gaming it's become my go to game to put a new controller through its paces. This, of course, worked exceedingly well with the Wii-Sports Resort run-out for MotionPlus. Once I had adjusted to controlling the left/right placement by the timing, rather than direction of my stroke, the Wii controls seemed the perfect compromise. Although I missed the ability to really drop the ball short, the physicality of ball-bat contact and sheer amount of spin have kept me playing for literally hundreds of hours. My hopes were high for Sports Champions' use of the PS3's Move controls. And initially I was impressed by how you had to move forward in real space to get into the net, as well as the ability to just hold the bat still to make a slight contact for a drop shot. 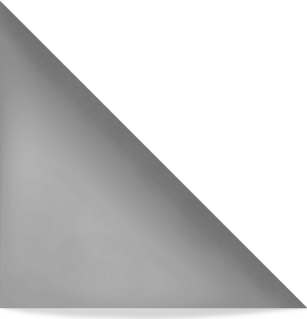 But the lack of connection between ball and bat, resulting from the assist function necessary to make the game playable at high speeds, took some of the sparkle away. I really wasn't expecting all that much from Kinect Sports table tennis - after all Kinect is about tracking limbs rather than hands. 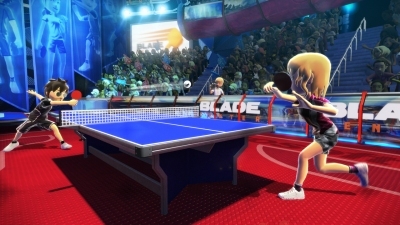 But I've been more than a little surprised by Rare's motion controlled sports collection - and their Table Tennis delivery in particular. Getting started with Kinect was simplicity itself. The camera is powered and adjusts itself to ensure the best view of you. Any calibration and setup is seamless - much easier and less problematic than the sometimes fussy Move, although not quite as instant as the Wii. And controlling the 360 with just your voice is eerily fun - and more importantly means you don't have to pick up a controller even before or after the game, a frustration with PS3's Move experience. The moment it placed a ball in my left hand - bat in the right - and asked me to serve was magical. The sense that the console was really seeing me totally changed how it felt to play. Tossing the ball with one hand and hitting with the other instantly made Wii-Sports mapping of both actions to one controller feel rather stilted. Having served, I could control my shots much more than I expected. Instinctively holding my palm flat I could sweep under the ball for backspin or over the top for a topspin. There isn't the same fidelity of spin as the Wii - or ability to curve the shot - but the sense of connection is maintained well. Kinect not only tracked my limb movements, but also my position in front of the camera and torso rotation. What I hadn't expected though was that Kinect not only tracked my limb movements, but also my position in front of the camera and torso rotation. I could move left or right to go wide for a shot - in fact I soon learnt that I needed to. And by rotating my body left or right I could easily step around a backhand to hit a forehand shot down the line. 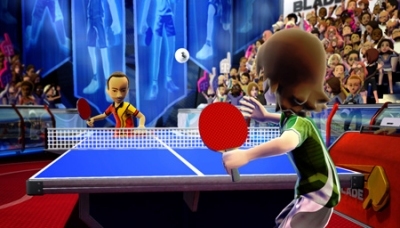 As the table tennis play speeds up, Kinect Sports calls in a few tricks from the Wii and PS3. 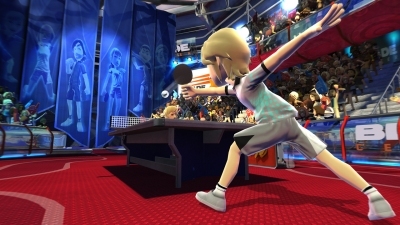 If you miss-hit a shot the ball gains a wobbly trail like in Wii-Sports Resort, indicating the other player can perform a smash. And like Sports Champions, at high speeds the game is less insistent on an actual contact between bat and ball to pull a shot off. It sounds strange I know, but this makes the really fast shots actually achievable. Timing of the shot still dictates how clean a contact you make though and the ball can be directed left or right by swinging in that direction. 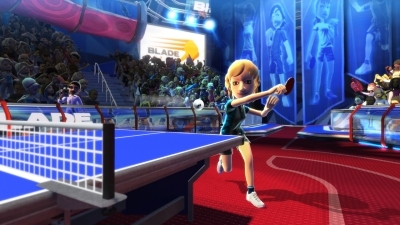 There's not the same physical relationship you have in Wii-Sports Resort, but easily enough control to develop a range of tactics and it's nice having back the direct relationship between the direction of swing and resulting trajectory of the ball. Combine a tight angle with a gentler swing and you can really move your opponent around the table. Drop shots are hard to pull off, and Sports Champions still has the edge here, because you need to make a striking motion to actually make contact with the ball. That said, combine a tight angle with a gentler swing and you can really move your opponent around the table. Not so good is that the best way to play multiplayer is online - the local mode suffers from reduced level of controls and the need for a large space to play in. With two of you in front of the sensor space is tight, this much I expected, but also the sensor seems to lose its torso detection that made the single player game work so well. It still works with two people, but loses some sparkle. 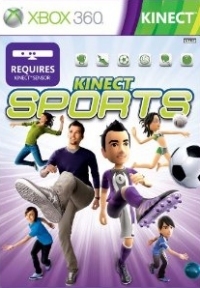 There are of course five other games in the Kinect Sports package - Bowling, Boxing, Football, Volleyball and Track. I was surprised how good the Bowling controls were, sitting somewhere between the fine tuning of Wii-Sports and positional shot selecting of Sports Champions. Bowling felt natural even though you are aware that mimicking the real world motion doesn't get you as far here as it does on the Wii. You have to perform more of a tennis sweep to dial in spin, but somehow this doesn't seem to matter with such a natural way to lineup and direct your shot in the first place. Boxing however clearly works better than it does on the Wii or PS3 equivalents. The real time one-to-one body tracking, that is always visible via your on screen avatar, creates a genuine physical connection. The exuberant gestures required in a boxing match fit this style of control perfectly - dodging and ducking work really well as you can literally drop to the floor to avoid a punch. Perfect for families - as proved by the whoops of joy from both me and my five year old son when we scored. Football is more turn based than its name or presentation suggest, but this is no bad thing. Each time you have the ball you simply kick in the direction of the player you want to pass to. Once you are in range of the goal you can take a shot. Defending is surprisingly good fun too, where you have to try and move yourself into the path of a pass before it's made - or get a part of your body in the way of the ball to save a goal. It's a simple scheme and one that is a million miles from FIFA or Pro Evolution. But for family play - as proved by the whoops of joy from both me and my five year old son when we scored - it's ideal, a perfect mix of tactics and exuberance. Volley Ball is similar to the Football game, although of course this lends itself more to the turn based game play. Translating each of the spike, set and strike shots to different bodily movements seems more natural than it does in a, usually free-flowing, game of football. For sheer exhaustion though, the Track and Field events have the edge. This takes us beyond anything Wii-Sports Resort or Sports Champions saw fit to include in their packages. We are into the sort of exhausting fun of Mario and Sonic at the Olympics here. Players use their bodies, running and jumping on the spot, to make headway down the track for sprint, endurance and hurdle races. It's simple and effective and extremely tiring. There is a full range of Track and Field activity including 100m Running, 400, Hurdles, Discuss, Javelin and Long Jump. The running works well provided you brings your knees up high, and there is a good sense of connection throughout. Any awkwardness from the camera is easily offset by the direct feedback of seeing your athlete mirror your moves. The breadth of delivery is testament to Microsoft's commitment to their platform - as well as their potential customers. The spaces in which you play are populated by the exquisitely detailed 360 avatar characters and full of movement and life. Rare again prove they are more than able to beat Nintendo at their own game as they show what a high definition Wii may have looked like - and pose not a few questions for just how Nintendo will move their platform forward without encroaching on much of this. As you are playing the Kinect camera is not only tracking your movement, but also taking pictures and video of your antics. Most excitingly though we finally get an online multiplayer mode in a motion controlled sports game. There have been so many times I've wanted to play Wii-Sports Resort online with my brother and his family, so it's great to have that option here. This is all rounded off by all the little touches that bring a real sense of play to proceedings. Although it sounds like a gimmick, the post game pictures and video are really clever. As you are playing the Kinect camera is not only tracking your movement, but also taking pictures and video of your antics - a little like In the Movies. These are then played back to you at the end of your game - all set to music. My kids always end up in hysterics watching themselves jumping around, and I have to admit it is very effective. Kinect is nonsensical name, but I guess that never stopped the Wii. Kinect Sports, and Kinect in general, has impressed me much more than I expected. The quality of both the movement detection, avatar mapping and sheer breadth of delivery is very appealing. While the play style sits somewhere between the PS3 and Wii - with the locational abilities of Move and the direction tracking of MotionPlus. Presentationaly though it takes on Nintendo at their own game and comes out on top. I still think Kinect is nonsensical name, but I guess that never stopped the Wii.